Along with the kitchen, the bathroom is one of the most used rooms in the entire house. Considering what it is used for, you may be wondering how you can keep it smelling and feeling fresh. Other than using harsh cleaners and deodorizing sprays that only work for a limited amount of time, you can keep the freshness alive by placing greenery in the room. Not only will this be visually appealing, but it will keep the bathroom feeling and smelling fresh. According to the lighting and ventilation in the bathroom, you will need to consider what plants will do best with the bathroom you are placing them in. When you purchase a plant or plants for the bathroom, get creative with where you place them. Hang plants over the shower or bathtub, place them in baskets or planters, or even hang them from the wall. It all depends on how the plant grows and how deep it needs to be rooted. Moss, in particular can be used on a rubber bath mat to create a soft, plush place to put your feet when you get out of the shower. Spider plants have long spider leg looking leaves. These plants are often hung or placed in planters off of the floor. Aloe can be placed in small planters around the bathroom. Plants that need more sunlight and ventilation should always go near the window. Hang it from the ceiling or place it on the windowsill. If you choose to put a tree in your bathroom, you must have a lot of floor space and windows. Place the tree as close to the natural lighting as possible. 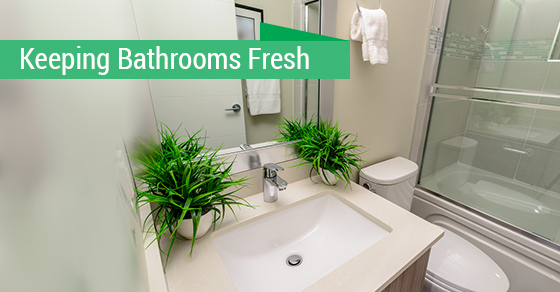 Choose a tree with large leaves to make the bathroom a true oasis for relaxation and serenity. Make sure that the tree you choose can do well in less ventilated areas and that it won’t grow too large. It must be a tree capable of growing out of a planter and within a home. To gain more knowledge of what plants do well in a bathroom and how to care for the plants you have chosen to incorporate, talk with someone at your local gardening store or contact us at Avonlea! We’ll be able to create your woodlands bathroom with style and creativity.